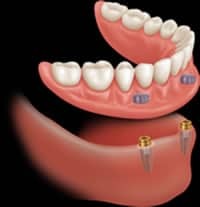 Dental Implants are cutting edge technology for tooth replacement and provide a long-lasting cosmetic and oral health solution for adults who struggle with tooth loss. A dental implant is made of Titanium or Zirconium, and is surgically screwed into the jawbone, in the place of a natural tooth root. 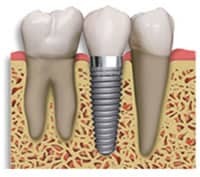 After 3 to 6 months of the healing process, the natural bone bonds to the implant, making it a solid union between implant and bone, which enables us to rehabilitate with an abutment and crowns. It is not necessary to grind down the adjacent teeth, like tooth replacement with a bridge. Maintain bone health/ avoid bone loss. 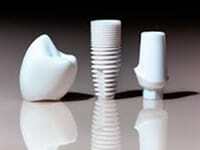 A single implant substitutes a single tooth that has been lost or needs to be extracted. Bridge over implants substitutes 3 consecutive teeth with 2 implants over a bridge. The above illustration shows three different options for replacing three missing teeth. The first is the most inexpensive, a partial denture that clips onto adjacent teeth. Made in just two visits, over 3 days, and costs about $495. The middle option shows a long, 6 unit fixed bridge. This would require filing down three of the adjacent teeth. 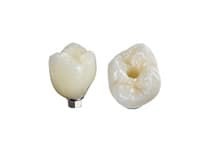 Using the best zirconium crowns, needed for strength to span the long gap, the bridge can be made two visits over 5 days. Cost would be about $2,970. 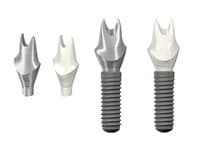 The third option, using two dental implants, is the best, because it isn’t necessary to file down the adjacent teeth, and the implants also help to retain the bone, limiting bone loss. Requires two stages, completed over 4 months. Can be made with standard porcelain crowns. Cost for both stages would come to $3,800. A removable complete denture supported by locator-connectors to the implants. The denture can be removed by the patient for cleaning. It requires a minimum of two implants and a maximum of four. The material used to make hybrid dentures over dental implants is a metal structure, covered by injected resin or acrylic. It can also be made of zirconium . This prosthetic device is not removable, and screws to the implants that are already placed in the jaw bone. Requires 4 to 6 implants in each arch. The type of treatment possible, is determined by the quality of the bone of the patient. Located in Tijuana’s modern downtown area, our professional, board-certified staff at Dr. Mexico are ready to provide you with high quality, affordable dental services. If it is a smile makeover you are looking for, or any other dental services, at Sam Dental we will provide you with dental care that is personal, professional, affordable, and guaranteed. Located in a state-of-the-art facility in Zona Rio, we at EG Dental are ready to greet you with a smile and make your visit a comfortable, professional and safe experience.